March is one of my favorite months of the year. Not only am I celebrating a birthday (I'm turning 27 on Monday! ), but La Petite Fashionista is turning 9 too! I can hardly believe I've been blogging my little heart out for so long. What a crazy & creative journey it's been! Besides the celebrations, everything starts to come back to life in the spring- the grass is becoming green again, flowers are blooming, and the sun is shining. I can't help but want to enjoy every moment of this beautiful season. 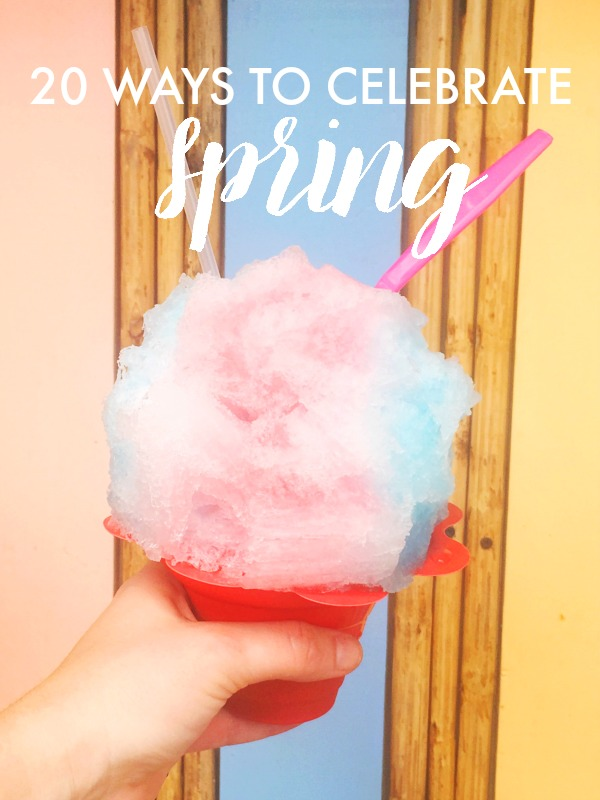 So, I'm sharing 20 ways to celebrate Spring! I'd love to hear your ideas too. 1. Start a gratitude journal- don't forget any of the happy moments of the season. 2. Do a spring cleaning closet detox using the KonMari method. 3. Host a garage sale to make some extra cash from the clothes you toss. 4. Get your girls together for a potluck brunch - don't forget the mimosas! 5. Learn something new! I have Mint & Lovely's Calligraphy Workshop with Saffron Avenue on my list! 6. Put on your favorite floral dress- I adore this botanical print (perfect for Easter!). 7. Plan a weekend trip with a friend or significant other! I love that Milwaukee is only a couple of hours away. 8. Check the free local events listings. Now that the weather is nice, there's always a local festival, concert, or event happening on nights and weekends. 9. Plant an herb garden so you can cook with fresh herbs all spring and summer long. 10. Volunteer! Giving back and being more philanthropic is a priority for me this year. Figure out your perfect niche whether it's working with animals, kids, or sweet elderly folks. 11. Check in with your goals for the year. I've been using Lara Casey's power sheets and it's been so influential in helping me keep priorities in check. 12. Plan a glamping trip - I've been wanting to do this forever! 13. Send a "just because" card to someone to brighten their day. I love snail mail! 14. Have a seasonal beer tasting night & rate your favorites with these cute cards. 15. Channel your competitive side & fill out a college basketball March Madness bracket. 16. Forget the blowdryer- embrace the heat and let your hair dry naturally. I love this overnight protector from living proof to tame my mane in the hot weather. 17. In my book it's not officially spring unless I've bought a new bathing suit for the year. I'm obsessed with this Tori Praver collection for Target. 18. Hit the farmer's market and make a meal entirely utilizing fresh produce. 19. Head to the nearest lake or beach to rent a Stand Up Paddleboard or Kayak for a couple hours. It's a great excuse to get out on the water. 20. Plan a picnic. Going alone? Pack a blanket and a good read and enjoy the afternoon! What are your favorite ideas for celebrating spring?